Great Show in an intimate settings- the cast are fab- it's full of great humour and music and has the feel of Old Las Vegas. A really super Evening and fully enjoyed it! We did purchase the complete package, which included dinner and priority seating for the show. The dinner was very good, as well as the waiter service. The priority seating was a sick joke. Although we were 15 minutes early and we did protest loudly that we had priority seating, we were forced to stand in the queue. This resulted in upon entering the theatre, that all the good seats in the middle of the theatrew were already occupied, so we were seated at the right side of the theatre, where we only had a side view on the stage. The show itself was very nice and we really did enjoy it! This show was fun and engaging. My wife and I loved the show and my father absolutely loved the show. The humor and the mannerisms and the voices where very much spot on. Great value, great fun and well worth the price. We did the VIP dinner package, and the food was very good. Fun show especially because we know the great hostess and bunny. Great voices and very enjoyable show. 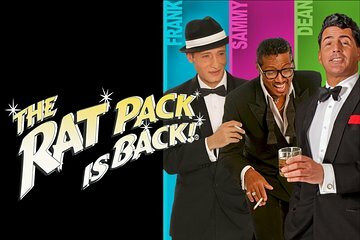 The Rat Pack was indeed Back! Great songs sung like Frank, Dean and Sammy did. The audience interaction was a hilarious. Frank and Dean's voices were similar to the originals. Dean had a resemblance to the original. A fun night out. Good show very entertaining. Restaurant at Tuscany Suites very good. I booked for six people with the three course meal and VIP seats. On arrival I was asked for photo ID even though I booked in my name, the tickets were in my name, my credit card had my name but no photo....what is it with the US about photo ID. Anyway, don't forget to take photo ID!!! Once we were allowed in.....The meal was fabulous and the service in the restaurant was excellent. All the staff were welcoming and efficient. The show was not quite what we expected although overall we enjoyed the experience. The VIP seats had all been taken by the time we got there which was not tragedy as it happens. It takes part in no more than a large room with a bar in the corner from which a waitress creeps around crouched over so as not to hinder your view trying to sell you drinks. We had one reasonably priced drink half way through the show. The Pack itself had pretty good voices to be fair and once you take yourself back to the era from which the show is based you start to get the humor, jokes, banter and so on. It is a very personal, close experience that we were all glad we did but it won't necessarily make it to the 'must go back' list. It was very good value for the money we paid, especially the upgrade for the meal which is a must. We gambled a little afterwards, had another drink or two then had a taxi back to our hotel. All in all, it was a pleasant evening. The show was great. The floor staff was horrible. We had six in our party so I called the day before to be sure we could all be together. Show night comes and the only six we can get all together is on the back row. I huffed and puffed all to no gain. so back row it was.. After the show all three members came outside for a meet and greet.NO CHARGE!!!! OVERALL A GOOD TIME AND GREAT SHOW.